In China, the Xi Ding brand has tended to be associated with dumplings served fast-food style. 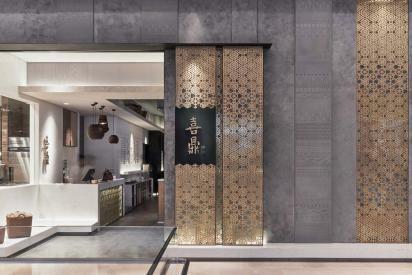 All the more to applaud the unveiling of its unexpectedly elegant flagship eatery in the port city of Dalian in northwest China. Here, the services of RIGIdesign have been tapped to create a comparatively sleek dining experience that also doubles as a canny rebranding exercise. From the outset, the restaurant’s MO is telegraphed to passers-by with a glassed-off frontage behind which a team of cooks rolls and folds the restaurant’s titular dumplings on a white marble counter. But even here, the design intention looms large with the entrance framed by a mix of stucco and gray panels embossed with a rattan pattern. RIGIdesign’s bent for geometric patterns is shown off to great effect in the interiors with ribbed ceiling grilles, walls encased in regimented rows of white-cast reliefs of dinner plates and bowls, and textured dividing panels lined with rattan, the latter a traditional, rustic material that’s given a modern makeover in this setting. In the evenings, clusters of lamps encased in decorative baskets throw comforting mood light. The overall effect, say the designers, is an homage to the tradition and history of the dumpling, though the greater triumph, we think, is the lush seafood dumpling.